Born and bred in a small mining town in the Midlands, I first came to Brighton on holiday in the 60s and was amazed by its wide diversity of architecture. All I knew of Brighton was that it was here that the veteran car run ended and it was the place where one came for a dirty weekend!! Three images remained in my memory from that visit, number one being the West Pier and the surrounding area with its small boating lake, paddling pool and beautiful sunken gardens. To me, it was very typical of what the seaside should be. Then there was the walk through the past by way of the historic lanes to be then confronted by the magnificent Royal Pavilion. I just could not believe that such an extraordinary building could be sitting right in the middle of what was then a town. After the initial impact, my first thought was how wonderful to be able to live in a place so grand. After the holiday was over I never imagined that I would ever be living in Brighton, but in 1966 that's exactly what I was doing, and loving it. Some years later, when I was attending an art class, and after learning the basics, we were asked to paint something which to us meant Brighton. 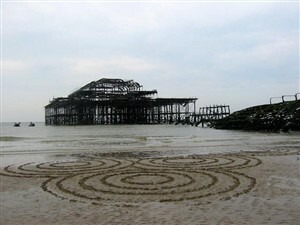 Most of the class did the Pavilion but mine had to be the West Pier, hence the picture. It's not the greatest piece of artwork but it was my first, and that's why I kept it. 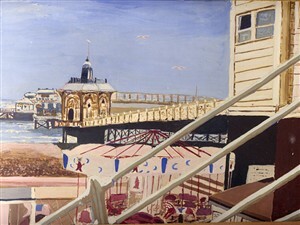 I could not have known then that the West Pier would disappear and my painting is a lasting memory of my first visit. 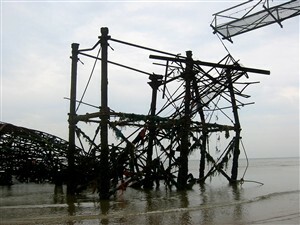 If I wanted to paint the pier now, it would be just a pile of rusty girders. What a terrrible shame it all is. As a postscript to this short reminiscence, when all those years ago I thought it would be nice to live in the Pavilion, I never dreamed that one day I would, well not actually live there, but I did end up working there and having, to spend so many hours at work, it did sometimes feel as though I was living in the Royal Pavilion. So you see, one never knows what life has in store and, yes, despite all the many changes, some not for the better, Brighton is still the place for me. This page was added on 24/06/2006. We are finding out some wonderful little gems about all our members from these stories - fascinating, I love the painting and had no idea you could!